As you begin to think about all of the features that you would like to incorporate into your outdoor living space, it can begin to feel overwhelming. And your UNIQUE designer will certainly be able to help you sort through your list of must-haves as well as the added features you would like. But as you prepare you’re your first meeting with your designer, it can be very helpful to have a brief overview of all of your options. This lets you have a clear mental list of questions and an idea of your goals for your outdoor living space. This will help your designer to create your perfect oasis. UNIQUE is one of the only fully licensed pool and landscape contractors in the valley. And in fact, UNIQUE is also a fully licensed general contractor. So consider if you would like a pool, spa or combination of both so that you and your designer can begin your plan by placing these large features. And if you are not fond of the idea of an open area of water then maybe consider a kid-safe splash pad for some summertime fun. As a general contractor, UNIQUE is licensed and qualified to build any type of shade structure that you might like to make your Phoenix summers more enjoyable. These structures can accommodate seating areas, your outdoor kitchen and dining area or even an outdoor television for watching the big game or hosting an outdoor movie night. Artificial turf is a great way to add a soft texture to your yard to contrast the granite, boulders and hardscape features. And unlike natural grass, artificial turf requires no watering, mowing or other tedious care. In addition, avid golfers and even the kids will enjoy a putting green. Out custom putting greens can mimic your favorite green at your golf club or any famous green in the world. Or you can request your own custom layout to have a one of a kind golf experience in your own backyard. Nothing adds to the ambiance and drama of your outdoor living space like a custom fire feature. You can choose from a fireplace, fire pit, wok pot with fire or even a fire and water feature combination. The options are almost unlimited and your designer can help you to incorporate your favorite fire feature into your new landscape. A fire feature will add to the interest of a single area at night but outdoor lighting will bring an entirely new dimension to your entire yard as the sun sets. Spotlights can highlight focal point plants and trees while path lights can allow for safe and easy navigation throughout your outdoor living space. And subtle lighting in seating areas will create a cozy and inviting feel. Shade structures can only provide some relief in the sweltering months of summer. But adding a professionally designed and installed mist system to your outdoor living area will provide you with comfort even on the hottest days. These professional systems are a far cry from the do it yourself models you find at the hardware store. The water droplets are less than 2 microns in size so you never need to worry about dangerous puddles, wet furniture or slippery steps. All these misters do is provide a wall of cool comfort around your seating areas and outdoor features. Now that you have an idea of all that can be included in your UNIQUE landscape design, you can begin to prioritize your outdoor living space and wish list before meeting with a designer. It can also be helpful to write down a list of questions or notes to be sure that you convey all of your desires. The more information that you can provide to your designer the more customized he or she can make your design. 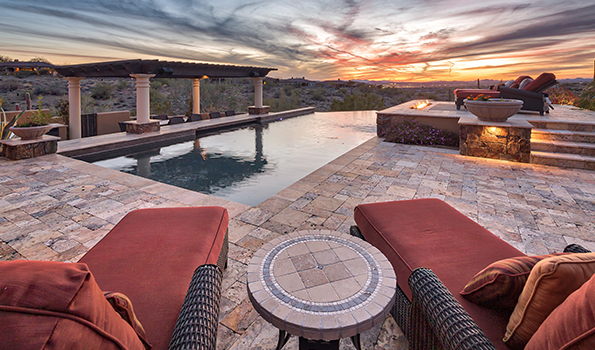 At UNIQUE our goal is always to create the perfect outdoor living space for each of our clients and we look forward to working with you to turn all of your outdoor living dreams into reality.